SEA FLOOR TOPOGRAPHIC, BACKSCATTER, AND INTERPRETIVE MAPS AND BOTTOM PHOTOS OF THE MASSACHUSETTS BAY DISPOSAL SITE REGION OFF BOSTON, MASSACHUSETTS. 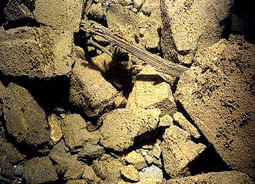 The Massachusetts Bay Disposal Site region has been used as a repository for dredged material, rock debris, sunken vessels, munitions, and construction debris. 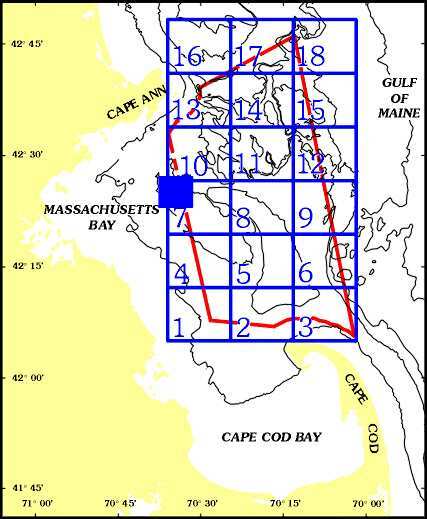 The site lies 17 nautical miles east of the entrance to Boston Harbor and is adjacent to the boundary of the Stellwagen Bank National Marine Sanctuary (see location map to the right). The area has had a complex history since the 1940's. The USGS/NOAA cooperative mapping program has acquired multibeam echo-sounder data in combination with video and still photos to describe the character of the sea floor and produce interpretive maps of the region. The maps were published in 1996, and are made available on this CD-ROM in Portable Document File, Encapsulated PostScript, and PostScript formats. For paper copies of any of these maps, please contact Page Valentine at the U.S. Geological Survey. Note: If you would like to print out any of these pages in black and white, go to File/Page Setup in the menu. Change the properties to black text and turn off the background printing option.